Yew Tree Cottage Self-cateringA spacious ground floor cottage-apartment next door to, and below, part of Holly Cottage (Property Ref. 1128), ideal for those who wish to avoid the use of stairs. The location is quiet and very pleasant - the cottage is set at the end of a pretty little cul-de-sac alongside the mature grounds of a former country hotel. There is virtually no passing traffic and yet the centre of Ambleside village is only a five minute stroll away just at the bottom of the hill. 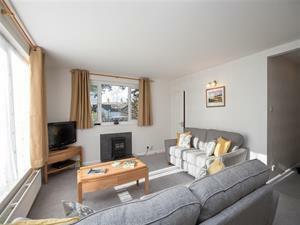 Regular visitors will know that the village is well served with excellent local shops, good restaurants, two cinemas, bowls, tennis and mini-golf. Mountain bikes can be hired locally and there are cruises on England's longest lake from the pier at Waterhead. The walkers amongst you will enjoy the challenge of the surrounding high fells and there are easier rambles to be had without any need to use the car on a daily basis. Accommodation: Covered outside porch shelters the front door entrance. Open plan L-shaped living area with kitchen at one end (TV, DVD, hi-fi, free wi-fi and electric flame-effect stove). The two bedrooms are accessed by separate doorways at each end of the lounge. Twin with portable TV and use of its own bathroom - bath with shower over, basin and wc. Double with king-size bed and en-suite (walk-in shower, basin and wc). Furnishings are comfortable with fitted carpets throughout. The property is well equipped for holiday use. Outside: There is private parking for two cars just behind the property. To the front there is a small patio area with room to sit outside with garden table and chairs and pleasant views of Wansfell and the distant sound of Stock Ghyll Beck beyond. Ambleside village centre 5 mins walk downhill. A spacious ground floor cottage-apartment next door to, and below part of Holly Cottage (Property Ref. 1128), ideal for those who wish to avoid the use of stairs. The location is quiet and very pleasant. Yew Tree Cottage offers weekly bookings starting on Saturday.